In our final installment of "Back-Road Adventures in Oregon", we visit the John Day Fossil Beds. These fossil beds span over 20,000 square miles and offer a valuable glimpse into the history of our environment. 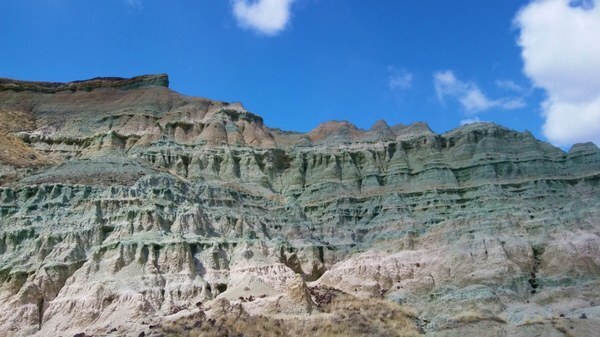 The John Day Fossil Beds National Monument is an exciting and interesting trip largely due to its uniquely well-preserved fossilized records of Cenozoic life. The evidence of past life is observed in the geologic strata, hills, valleys, and rock terraces of this incredibly spot in Eastern Oregon. There are three unique geological locations here: the Clarno, Painted Hills, and Sheep Rock units. I recommend giving each of these locations at least one full day for exploration. It's possible to do them all in one day if you leave early enough, but it doesn’t give you much time to really see, explore, and experience this fascinating area. The Palisades. Photo by Regina Robinson. The Clarno Unit is located on Hwy 218, about 18 miles outside of Fossil Oregon. 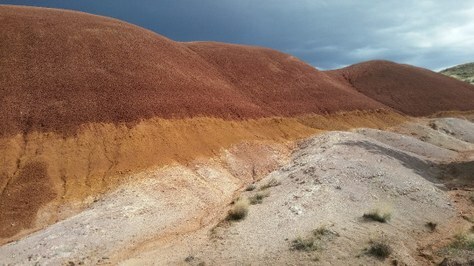 It holds the oldest exposed layers of the John Day Fossil beds, with deposits ranging from 35-50 million years ago. This area was once a wet, hot, semitropical paradise filled with flying bird and insects, and dense forests that received up to 10 feet of annual rainfall. This area was home to many plants that have modern day equivalents: banana trees, palms, chestnut trees, and oaks, and more. 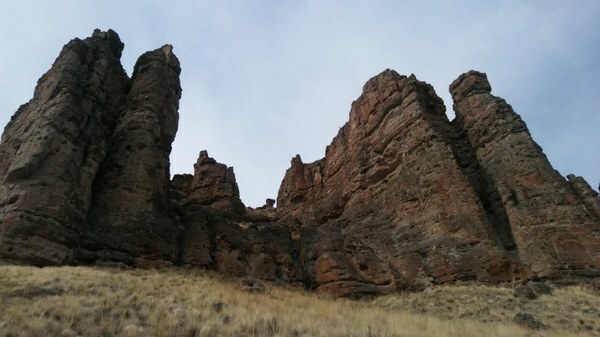 The Palisades, the prominent rock featured at the Clarno Unit, is an imposing 150-ft looming rock formation that was created by a volcanic mudflow, also knowna as a lahar, 40-54 million years ago. This succession of lahars created the Cenozoic fossils you see today. Near Mitchell Oregon, you can see the remnants of the ancient volcanic range, the Ochoco Mountains, in the cone shaped hills that dot the landscape. Searching for fossil remains among the rocks and cliff walls makes for an incredible day. Here, you will find more than 175 different species of plant life and ancient jungle animals, including tortoises, crocodilians, tiny three-toed horses called “Orohippus major,” and “Brontotheres,” which are huge mammals similar to that of a modern day rhinos. We parked at the Palisades picnic area and started our hike with the Geologic Time Trail. We stopped and read every placard, trying to imagine what the landscape would look like as a wet, semi-tropical paradise before the cataclysmic events that completely changed the landscape forever. We took our time and looped all three trails together for an all-day out and back hike. There is no shade, and hiking boots are preferred as poisonous snakes are quite prominent here. Bring a camera and keep an eye out for fossils. We searched every rock boulder and found many. What are you going to find? Trail of Fossils is a 0.25-mile loop where visitors can see fossils in the rocks. It is a fairly easy trail with large boulders strewn below the Palisades, containing dozens of visible plant fossils from the near-tropical forest that blanketed the region 44 million years ago. Clarno Arch Trail is a 0.25-mile round-trip trail with just 200 feet in elevation, bringing visitors directly under a natural arch cut into the cliff by erosion. Her petrified logs are visible in the cliff face. We counted about 5 fossilized logs, how many can you find? Geologic Time Trail is 0.5 miles round trip, connecting the picnic area to the trailhead. Stop and read the signs along the way - each foot of this trail represent 37,000 years! Note the significant climatic and geological events of the last 50 million years. The Painted Hills Unit. Photo by Regina Robinson. 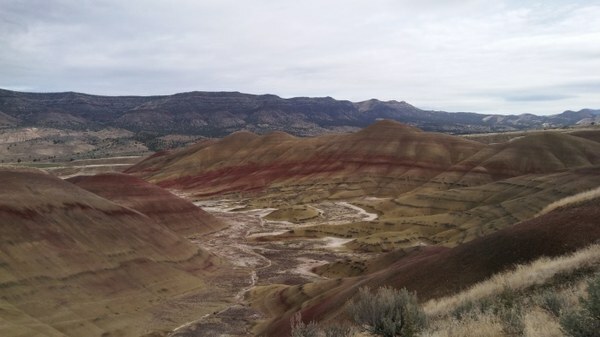 Located 9 miles northwest of Mitchell Oregon on Hwy 26, Painted Hills is proof that major climatic changes about 33 million years ago took place to create a drier, balmier Eastern Oregon. This area used to be covered with lakes, swamps, and hardwood forests. The trees dotting this ancient landscape are similar to our modern day alders, maples, oaks, and elms. Here you can find the remains of one of my favorite tree species - the Sequoia. This unique species is a “dawn redwood” called the Metasequoia. Today, its closest living relative exists in Eastern Asia. Because of the swamp-like environment preserved fossils are mainly fish and amphibians, but also include salamanders, bats, birds, insects, and trees. The Painted Hills fossils range from 30-39 million years old, with some outcropping rocks on the hillsides containing animal fossils dating from 27-30 million years old. About 110 different leaf species and 58 varieties of nuts, seeds, and cones can be found among the fossils. If you find a fossil, do not remove it. Document its location, photograph it, leave it, and let a ranger know – the study of this area by paleontologists and geologists is ongoing. We started our Painted Hills adventure on the Painted Hills Overlook Trail, a short uphill to magnificent views. From there we headed downhill and across the street to the Carroll Rim Trail. This trail has a moderate uphill grade, with no shade and the potential to be quite hot during the summer. Once we crested the top of the hill we were in store for magnificent, 360 views of the surrounding region. The Leaf Hill Trail was next. This short loop led us through tall shady trees to a huge pile of fossils - do not cross the barriers as this is an ongoing dig observation site. We drove to the end of the road to the Red Scar Knoll trail, a 1.5-mile trail showing a variety of landscapes, from grasslands to scrub vegetation. Here we picnicked under the shade of trees and enjoyed the birds and gentle spring breeze. I’m very happy we saved the Painted Cove Trail for last. Most of this trail is boardwalk, to protect the delicate popcorn-like claystones that dot this magnificent landscape. Here you can really see the reds, yellows, and purples of the hillsides up close. Make sure to bring a camera, because the opportunities for great pictures abound. Trails: The Painted Hills Unit has a total of five trails, each with their own parking area. Directional signs along Bear Creek Road point the way to each trailhead. RVs and other large vehicles are not recommended past the Painted Hills Overlook. Restrooms can be found at various stops along the route. If none are available please practice Leave No Trace Principals. Carroll Rim Trailis 1.6 miles roundtrip. This trail climbs just over 400 feet of elevation to a panorama view of the Painted Hills. Overflow parking is available at the Painted Hills Overlook. Painted Hills Overlook Trail is 0.5 miles roundtrip. This trail is relatively flat, following an old road and offering impressive views of the Painted Hills. Painted Cove Trailis a 0.25 mile roundtrip trail that offers an amazing color palette of vibrant rocks. A portion of this trail features a level boardwalk to cross over sensitive soils. Please stay on-trail as the soil is delicate. Leaf Hill Trail is 0.25 miles roundtrip. Leaf Hill has been extensively excavated and studied by paleontologists. Interpretive signs along the trail explain its history. Red Scar Knoll Trail (Note: The Red Scar Knoll Trail is called Red Hill on the road signs), is 0.25 miles roundtrip. This mostly-level trail leads to a hill of bright yellow and red clays. The Blue Basin Overlook trail's view of the Turtle Cove Assemble. Photo by Regina Robinson. Sheep Rock is located on Hwy 19 between the towns of Kimberly and Dayville. Driving through the Picture Gorge Canyon, the basalt cliffs were stunning. All I wanted to do was pull the car over and take photos. These basaltic cliffs formed 16 million years ago, with basaltic lava flows between 50 and 1300 feet deep that traveled 2,500 miles, incinerating everything in its path. These amazing cliffs are separated into 17 different layers of distinct flood basalts, making quite an impressive entrance to the Sheep Rock Unit. This portion of the John Day National Monument is known for its distinctive blue-green claystone. Here, many of the plants and animal fossils date back as far as 89 million years ago. As the climate continued to cool and dry grasslands began to appear, creating an environment with more open meadows and less dense forests. “Nimravids,” a type of cat-like animal, giant pigs, beavers, and ‘bear-dogs’ (an animal that I think would have been neat to see) called “Daphoenodon” were present. For the first time, burrowing rodents begin to establish themselves – the distant relatives of our modern deer mice, shrews, and moles. It is hard to choose a favorite of the three units, but if I had to choose I’d pick Sheep Rock. Here, the dusty yellows and browns of the desert meet the deep blue of a wide open sky and the turquoise of the nearby cliffs and rocks. It's utterly stunning. We started our day off at the Thomas Condon Paleontology Center, spending hours going through the exhibits and speaking with rangers, who graciously identified the fossils that we had dug up in Fossil Oregon at the local high school. From the center we drove up to a view point to observe Goose Rock. We continued up the road to the Blue Basin area. We choose the Blue Basin Overlook, a hard-packed sand trail which we linked it to the Island In Time trail. We created a loop by first heading uphill, as we did not want to be hiking to the top of the basin during the heat of the day. Even though the day started with slight snow flurries, it quickly warmed. Traveling uphill we stopped and enjoyed breaks under the shade of the few trees, taking in the views of the canyon below and the ridge above. At the top of the basin be prepared for a striking view; deep contrasts between the blue-green layered rocks, the yellow grassland, and the reddish-purple hills of Cathedral Rock are a sight to behold. Take your time going downhill – many wildflowers can be seen here, from phlox to lupine. The Island in Time trail is short, crossing over several metal bridges with deep sharp grooves. Here you can see the banded layers of the blue-green claystones up close. Along the way there are interpretive signs and displays with a lot of great reading material about the differing time periods and fossils to be found in the basin. Off-trail hiking in the basin is forbidden as it disturbs delicate soil and plant life and a portion of the trail passes through private ranchlands. At the Foree trailhead, ‘Flood of Fire’ and ‘Story in Stone’ trails were our next stops. These short but informative trails were definitely worth the stop. The Flood of Fire follows a very short gravel trail up a small ridge to a viewpoint overlooking the John Day River valley, showcasing the colorful Cathedral Rock. The Story in Stone follows a mostly-paved trail through a small basin of blue-green claystone. This formation is similar to the Blue Basin, with fossils dating back 25-30 million years ago. After exploring the Foree section we found a shady picnic spot to eat lunch and recap our day. What an adventure! Island in Time is a gravelly 1.3-mile roundtrip trail that ascends to an amphitheater carved out of the blue-green claystones of the John Day Formation. The volcanic ash, now turned to stone, contain a rich variety of vertebrate fossils. Interpretive signs and fossil replicas are located along the trail. Blue Basin Overlook is a 3.25-mile loop trail. This trail is amazing, but plan to do it early in the morning as there is very little shade. It brings you to an overlook that provides amazing views of the John Day River Valley. It is dusty in places and may be impassable in wet weather. It is moderate to strenuous with over 600 ft. in elevation gain (and loss). Flood of Fire is a graveled 0.4-mile trail, ascending a small ridge to a viewpoint overlooking the John Day River Valley and a colorful rock formation similar to that of Cathedral Rock. Story in Stone is a 0.3 mile, fairly level, mostly paved trail that skirts above a small basin of blue-green claystone. The formation contains fossils of animals that lived here 25-30 million years ago. River Trail is a 0.6-mile trail of mostly-level packed gravel, leading to the John Day River from the Cant Ranch parking lot. Sheep Rock Overlook Trail is a 5-mile trail that starts at the front gate of the Cant House. It ends at an overlook with a great view of the valley and the river. Driving between destinations, you'll find very few services. Gas stations are usually closed after 5pm and have very reduced hours on Sundays. Grocery stores may close “early”, especially in the off seasons. ATMs are few & far between, and cell phone service may be intermittent as the area is mountainous. Be prepared for weather changes. We went during early spring and encountered the whole gamut of weather, from sunny days to rain and snow. In many of these places shade is minimal and poisonous snakes are very much at home here. Hiking boots are recommended. The only place you can dig for fossils and take them home is in Fossil Oregon. Bring a camera, a sense of adventure, and have fun - this whole area is full of things to see and do. Plan out your camping. We were fortunate that the campgrounds had open spots when we arrived, but planning ahead is recommended to ensure you have a place to lay your tent. If I had to do our trip of the John Day National Monument over again, I would have started at the Sheep Rock Unit first as it is home to the Thomas Condon Paleontology and Visitor Center. The museum has plenty of fossils, as well as information regarding geology, paleontology, and history, with rangers on duty to answer any and all of your questions.